Attending a homeschool convention is something I look forward to every year. Surrounded by books, friends, and ideas for how to get the most out of our homeschool experience gets me ready to take on another year. If you don’t prepare for the convention, however, it can seem pretty overwhelming. My first couple years of attending a homeschool convention were mostly for social purposes. I met up with friends who lived all over the state and had a good time catching up, laughing, talking and book shopping. As the years have progressed and I started looking at other curriculums, I decided to start attending some of the sessions offered. I enjoyed them so much, I didn’t have enough time to shop for books last year because I was so busy attending the different sessions. 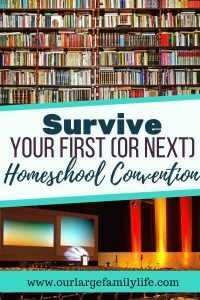 If you are attending your first homeschool convention or just want to make sure you are well prepared for your next homeschool convention, let’s talk about what you can do to make your days at the convention go smoothly. Location: Many states have their own conventions through their own organizations. This is a great option if you don’t want to spend the night. If there is one that is within a couple hours, it makes it easy to drive there and back on the same day. There are also national homeschool conventions that are located in bigger cities. The benefits to these are you will find many more well-known speakers plus more vendors. The downside is they only go to major cities, so if you don’t live near them you will have to be willing to travel and stay at the location. Speakers: Look at the list of speakers to see what sessions you won’t want to miss. It will also give you the chance to look up the speakers and get an idea of how there talks with go. Vendors: My favorite part. I love love love looking at books and curriculum. At the conference, you get the chance to page through things you have seen online to see if they will be a good fit for your family. Checking out the vendor list will give you an idea of what you will see there as well as what won’t be there. In recent years, I’ve noticed a decline in vendors as more and more people choose to order online. It’s always a good idea to pre-register for a conference if you know you will be going. It will save you money since preregister rates are less than at the door tickets. It will also save you time when you get to the event. You won’t have any paperwork to fill out or mess with paying. You will be able to check in and move on to the event. Some places may also have some perks for pre-registering. For instance, the conference I went to last year allowed you to get audios from all the sessions for a steeply discounted rate that was available only to those that pre-registered. When you have decided on a conference, it will be a good idea to look at the speaker schedule so you can see what sessions and speakers you would like to see. Knowing beforehand will mean you will be less frazzled at the conference trying to figure out where to go. It will also give you a chance to figure out when you will be able to spend time in the vendor hall. Along with the speaker list, you should be able to see a list of all the vendors that will be at the conference. If you’ve been wanting to see a new curriculum or want to see what’s out there, the vendor hall is a great place to get your hands on the books and see what they are really like. Pro Tip: Some publishers also give a discount when you order at the conference so you may want to save your orders for when you are attending the convention. Comfy shoes are a must. You are going to be walking quite a bit going from room to room to the vendor hall, and finding a place to eat. Wear shoes that won’t make your feet scream or your day just might be ruined. A notebook and pen. If you are attending any speaker sessions you will want to bring something to write down tips and nuggets that the speakers give you. If you are a phone person and like typing notes, or taking pictures of slides, do whatever works for you. Something to carry all the books. A rolling suitcase, a foldable cart. A stroller. If you are thinking you might get bit by the book-buying bug, your arms will thank you if they don’t have to do the heavy lifting. Food and Drinks. As with any kind of event location, onsite snacks and drinks are going to be expensive. If you want to help your budget (so you can buy more books), bring your own food or plan to leave the location in search of cheaper restaurant options. Your Family. Some conventions have things for the whole family to do, so this is something you can think about if you want everyone to come. Make sure you bring everything you would need for them as well ( i.e. more food). The biggest tip for when you are at the conference is to be aware of the time. If you are planning to arrive right when the conference opens, know that it is going to be busy and crowded and will take longer to get in, especially if you didn’t pre-register. If you have some well-known speakers at the conference you are looking forward to hearing from, try to get to the room a little early so you will be to find a spot to sit. Pay attention to the times of the vendor hall so that you can get enough time in there. The vendor room usually closes down before the last speaker, (at least at the conferences I’ve been to) so don’t leave it till the end of the day and then be disappointed they are closed. If you have questions about curriculums, now is the time to ask. The vendors there will be more than happy to answer your questions about how their curriculum works and will have suggestions for how you can use it well. Don’t get stressed out with all the advice. Just because things work well with one family doesn’t mean it will work for yours, and that’s ok. Take the ideas you think will work for you and forget the rest. 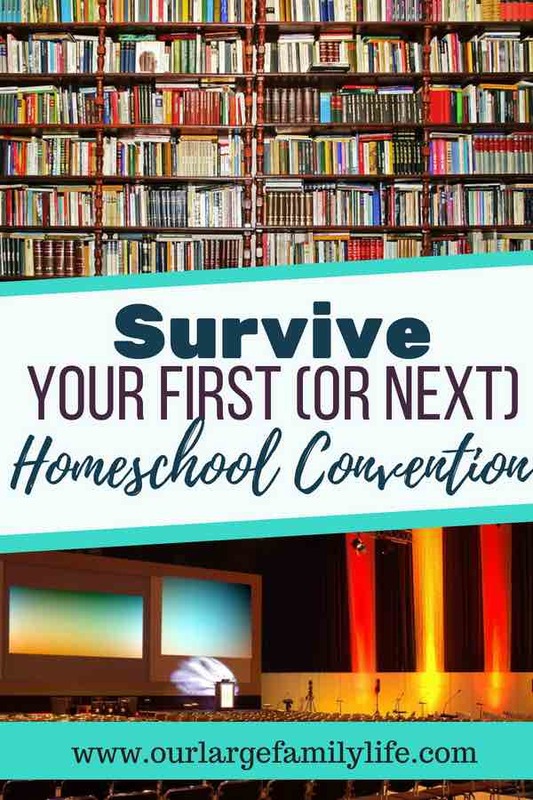 Attending a homeschool conference is a great way to educate and encourage you on your homeschool journey. The best way to survive your first (or next) conference is to be prepared. Knowing where you are going, who you will want to hear, and what vendors you will want to see will help you have a successful trip to your homeschool convention. What do you look forward to the most at a homeschool convention?